March 4, 2015 – Adm. Peter Cressy has announced his plans to step aside as CEO of the Distilled Spirits Council of the United States at the end of the year, following nearly 16 years at the trade group’s helm. The 73-year-old retired US Navy Rear Admiral plans to return to the University of Massachusetts at Dartmouth, where he previously served as Chancellor and remains a tenured professor in the University’s business school. 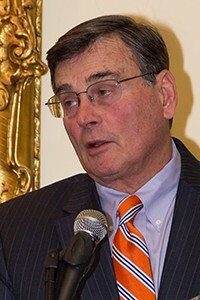 Under Cressy’s leadership, the association was successful in modernizing liquor laws and regulations at the federal, state, and local level. He was also instrumental in expanding the industry’s international reach with the creation of an export promotion program, and spearheaded the project to restore the historic distillery at George Washington’s Mount Vernon estate in Virginia.